Portable Spill Containment Products are designed to provide easy spill control and transportation in your location. 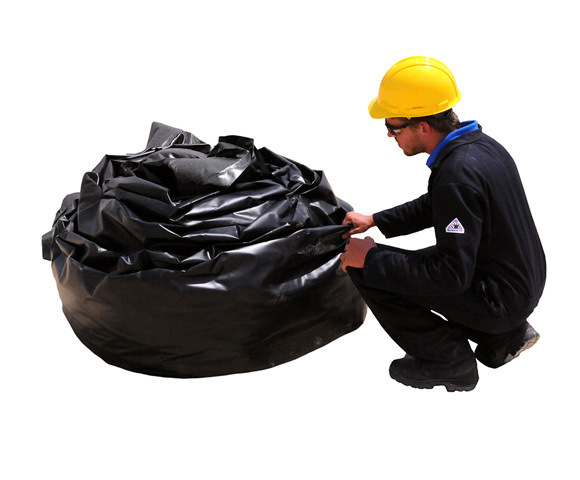 Built in a range of different sizes and styles, these products have helped with frequently changing spill locations, emergency response, and quick reaction under leaks and spills. Available options include pop up containment pools, portable spill berms, and more. Questions? We can help! Call our team at +1-772-646-0597 or fill out our quote request form to discuss your project. Choosing the transportation method for your berm will depend largely on the type of berm you will be moving. The information provided below lists some common designs and transportation methods for each individual containment product. Foam Wall Berms: The foam wall berm features a flat liner that contains 4", 6", or 8" foam walls. This low-profile structure allows berms to be rolled up with the walls still intact. Once the entire berm has been rolled up, ties or strings can beused to keep the berm compact. Aluminum Angle Berms: Typical design for the aluminum angle berms includes walls with side pockets for the removable L bracket angles. For transport, angle brackets can be easily removed from the pockets and placed in a carrying bag. After all of the brackets have been removed, the berm liner should remain flat. This makes it easy to fold up and transport to the next location. Mini Spill Basins: Another easily transported product is an item known as the mini spill basin. This small spill berm features built-in fiberglass rod walls that can bend and fold as needed. Often small and lightweight in size, these berms can be transported by hand to their next location. For more information on these and other containment products, please check out all of our Portable Spill Containment Products. Learn More about GEI's Secondary Containment.